This year marks the 40th anniversary of the classic comedy flick Monty Python and The Holy Grail. The occasion is being marked by a brand new Blu-ray release packed with new features. 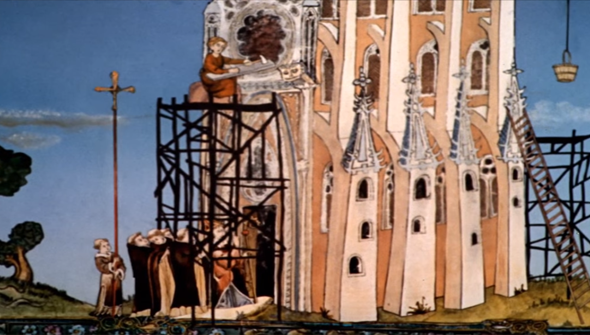 Including about 14 minutes of Terry Gilliam's original (sometimes unfinished) animation that has never been seen before. The animation has been re-edited and a new soundtrack recorded. It even features some previously unreleased music from frequent Python collaborator Neil Innes. The freshly uncovered footage will be included on the new release with commentary by the man himself. However, you can get a look at the animation before you buy it as it's been released via the Official Monty Python Youtube channel, and you can watch it for yourself below. Gilliam's work was hugely ground-breaking despite its apparent simplicity. It also was one of the earliest examples of animation being aimed at an adult audience made in the UK. It's also a key part of the work of one of the world's most influential comedy groups. Don't expect a great deal of insight into the process in Gilliam's commentary though. But- of course- it's very funny. The Monty Python and The Holy Grail 40th anniversary edition will be available October 27th in the US and is out now in the UK.